Hospitals use string instruments to reduce the stress of health care professionals and aid in the healing of patients and their families. This practice dates back to early Greek and Roman times when musicians played their music as healers and physicians burned incense and prepared herbs. 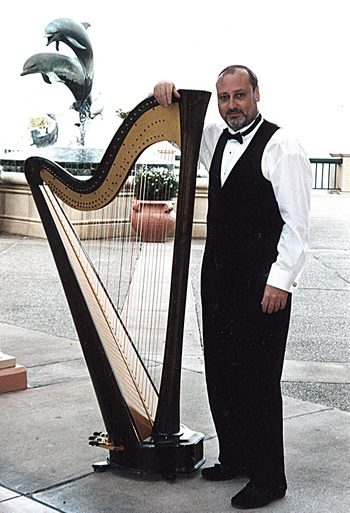 Michael Culver's harp music enhances the traditional soothing nature of the art. Explore this site and learn more about Michael and his music. Whether playing as a soloist or as part of an ensemble, Mike's smooth, soothing sound and classical touch delights all of those who hear him. As a classically trained musician with a keen sense of rhythm and tone, Mike's versatility and joy of playing comes through with every note. In addition to being a soloist, Mike is part of several instrumental ensembles including The Monterey Harp Trio, The Cypress Coast Strings, The Mike Culver Trio and The Bolero Brothers. 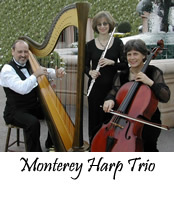 The Monterey Harp Trio provides your wedding with a beautiful pastoral sound The Celtic origins of the Flute and Harp lend themselves well to the outdoors and are a perfect complement to any garden setting. This group produces music with a warm, full-bodied texture. The music seems to sound and carry even better outside. Simply put, they blend well with nature. 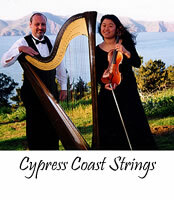 When The Cypress Coast Strings play, their music speaks for itself. The expressive and close knit musicality of this duo is heard immediately. This combination of strings, 44 to be exact, create beautiful overtones as well as beautiful music. They set the stage for an elegant and classy occasion. 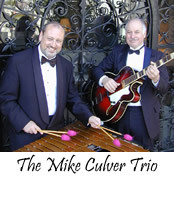 As part of the Mike Culver Trio, Mike excels on the Vibes and plays the music of great American jazz artists. As a duo with guitar or upright bass and a trio with all three, the music is perfect for background dinner music and is also very danceable. Mike also doubles on piano. Mike is also part of The Bolero Brothers, who's combinations of Mexican harp and Flamenco guitar are unique. The beautiful sound and appearance of these two hand crafted instruments are heavenly. This duo is at ease strolling acoustically in a garden venue or on a stage with amplification. The Bolero Brothers add a sophisticated elegance to any event.